BARRETT, J., Cpl., 2nd Essex Regt. and M.G.C. A serving soldier at the outbreak of war he was shortly afterwards drafted to France and took part in the Battles of the Marne, the Aisne, Ypres, Armentieres, Ploegsteert Wood, and was severely wounded on the Somme in July 1916. He was invalided to hospital at Boulogne and Manchester, and after his recovery Was engaged on important instructional duties in machine gunnery and drill at various home stations. He holds the 1914 Star, and the General Service and Victory Medals, and was demobilised in March 1919. 13, Azof Street, Greenwich, S.E.10. BARRETT, J. H., Cpl., Cameronians (Scottish Rifles). Mobilised at the outbreak of war, he took part in the Retreat from Mons and in the Battles of the Marne, the Aisne, Neuve Chapelle, and Hill 60, being wounded in September 1915 and sent to hospital at the Base. On recovery he was in action at Vimy Ridge, the Somme, Arras, Ypres, Passchendaele, Cambrai, Bapaume and Havrincourt, and was again severely wounded in 1918, and invalided home. After hospital treatment he was demobilised in February 1919, and holds the Mons Star, and the General Service and Victory Medals. 46, Henslowe Road, East Dulwich, S.E.22. BARRETT, J. R., Private, R.A.S.C. Volunteering in June 1915, he was drafted to France in the same month. He was engaged on important transport duties on the Somme, and at Armentieres, Vimy Ridge, Loos and other places, and Lille, and after the Armistice did excellent service at the railheads at Brussels. In this theatre of war he was twice gassed. He was demobilised in March 1919, and holds the 1914-15 Star, and the General Service and Victory Medals. 25, Rudford Road, Rotherhithe, S.E.16. BARRETT, J. W., Private, R.M.L.I. He was serving at the outbreak of war, and was engaged in H.M.S. "Cressy" till that vessel was sunk in the North Sea in September 1914. In April 1915 he proceeded to Gallipoli, Where he took part in many important engagements, and was unhappily killed in action on June 26th, 1915. He was entitled to the Naval General Service Medal (with clasp Persian Gulf), the 1914-15 Star, and the General Service and Victory Medals. 70, Rotherhithe New Road, S.E.16. BARRETT, M., Pte., 1st Q.O. (R. West Kent Regt.) He was mobilised in August 1914, and was immediately sent to the Western Front. He served in the Retreat from Mons, and was wounded. On his recovery, after hospital treatment in London, he returned to France in 1915, and in the second Battle of Ypres was again wounded. Evacuated to England, he was discharged owing to his injuries in 1915, and holds the Mons Star, and the General Service and Victory Medals. 46, Warwick Street, Deptford, S.E.8. BARRETT, W., Private, 3rd Dorsetshire Regiment. He joined in August 1917, and early in the following year, after completing his training was sent to France. He took part in numerous engagements of importance in the Retreat of 1918, including those on the Somme, and after being wounded near Arras, was invalided home. He was demobilised in January 1919, and holds the General Service and Victory Medals. 25, Enid Street, Rotherhithe, S.E.16. BARRETT, W. J. R., Rifleman, Rifle Brigade. Having volunteered in September 1914, he was drafted to France in August of the following year. He took part in much severe fighting at Loos, the Somme, Ypres and Armentieres, and after being wounded in action at Delville Wood on September 3rd, 1916 unfortunately died of his injuries eight days later. He was entitled to the 1914-15 Star, and the General Service and Victory Medals. BARRIER, H. G., Pte., Q.O. (R. West Kent Regt.) A serving soldier, he was drafted to France at the outbreak of war, and took part in the Retreat from Mons, and in the Battles of the Marne and the Aisne. He was wounded at Ypres in November 1914 at Hill 60 and again in the Battle of the Somme in July 1916, but after a period in hospital at home he continued his service until the cessation of hostilities. He went to Germany with the Army of Occupation, and was discharged in June 1920. He holds the Mons Star, and the General Service and Victory Medals. 20, Lenthrop Road, Greenwich, S.E.10. BARRINGTON, H., Private, Middlesex Regiment. He volunteered in March 1915, and shortly afterwards was drafted to France, where he took part in the Battles of Neuve Chapelle, St. Eloi, Hill 60, Ypres and Festubert. He was unfortunately killed in action at the Battle of Loos in the autumn of that year, and was entitled to the 1914-15 Star, and the General Service and Victory Medals. "He passed out of the sight of men by the path of duty and self-sacrifice." 33, Peekham. Park Road, Peckham S.E.15. BARRINGTON, J., Sergt., 18th Welch Regiment. He was mobilised in August 1914, and was immediately sent to France. He was in action at Mons, Ploegsteert Wood, Ypres, and in numerous other engagements. He was severely wounded in action, and unfortunately died of his injuries in September 1917. He was entitled to the Mons Star, and the General Service and Victory Medals. "He joined the great white company of valiant souls." 33, Peckham Park Road, Peckham, S.E.15. BARRINGTON, J. T., Private, R.A.S.C. Having volunteered in April 1915, he was drafted to France in the same month. He was engaged on important transport duties at Neuve Chapelle, St. Eloi, Hill 60, Ypres and Loos. He was badly gassed and invalided home, and after a period in hospital was discharged owing to his disability in December 1915. He holds the 1914-15 Star, and the General Service and Victory Medals. BARRINGTON, W., Private, 2nd Welch Regiment. He was serving at the outbreak of war, and was immediately afterwards sent to the Western Front, where he took part as a Signaller in numerous engagements of great importance, including those at Mons, Ypres, Loos, the Somme and Arras. He was wounded and invalided home, but on his recovery was drafted to Salonika. He contracted malaria whilst in the East, and was again sent home. He was discharged in October 1918 as medically unfit for further service, and holds the Mons Star, and the General Service and Victory Medals. BARRITT, T. G., Sapper, R.E. Joining in June 1916, he underwent a period of training prior to being drafted to Italy. Whilst in this theatre of war he was engaged on various important duties at many places, and also took an active part in much of the severe fighting until the cessation of hostilities. Returning home in 1919, he was demobilised in April of that year, and holds the General Service and Victory Medals. 25, Banyard Road, Rotherhithe, S.E.16. BARROW, A. W., Sergt., 1/6th London Regt. (Rifles). He volunteered in May 1915, and in September of the following year was drafted to the Western Front, where he saw severe fighting in various sectors. He took part in the Battles of the Somme, Ypres and Cambrai, and many other important engagements, and was wounded in action at Messines in June 1917. He returned home in August 1918, and was retained in England until his discharge in March of the following year. He holds the General Service and Victory Medals. BARROW, J. E., L/Cpl., 3/6th London Regt. (Rifles). He volunteered at the outbreak of war in August 1914, and in the following year, was drafted to France, where he saw severe fighting in various sectors of the Front. He took part in many important engagements in this theatre of war, and after the cessation of hostilities, proceeded with the Army of Occupation into Germany. He returned home, however, for demobilisation in February 1919, and holds the 1914-15 Star, and the General Service and Victory Medals. 55, Kenbury Street, Camberwell, S.E.5. BARROW, W. H., Pte., 4th London Regt. 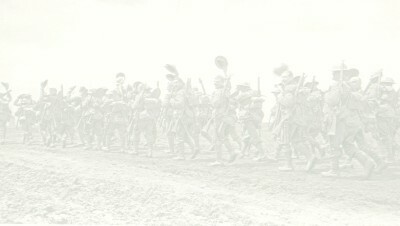 (Royal Fusiliers). Having enlisted in July 1913, he was drafted to the Western Front immediately on the outbreak of war in August of the following year, and there took part in the Battle of Mons. Severely wounded in action in the subsequent Retreat, he was invalided home, and after his recovery, retained on important duties in England. After the cessation of hostilities he was sent with the Army of Occupation into Germany, finally returning home for discharge in June 1920. He holds the Mons Star, and the General Service and Victory Medals. BARRY, H., Private, Hampshire Regiment. He volunteered at the outbreak of war in August 1914, and on completing his training in the following year, proceeded to the Dardanelles in H.M.T. "Royal Edward." He unhappily lost his life when that vessel was sunk by a submarine in the �gean Sea on August 14th, 1915. He was entitled to the 1914-15 Star, and the General Service and Victory Medals. "A costly sacrifice upon the altar of freedom." 11, Reed Street, Rotherhithe, S.E.16. BARRY, J., Rifleman, 1st Rifle Brigade. Having previously fought in the South African campaign, he was mobilised at the outbreak of war in August 1914, and was immediately drafted to the Western Front. There he was taken prisoner at the Battle of Mons in the same month, and held in captivity at Doberitz Camp, suffered many hardships until his release in December 1918. He was discharged in that month, and holds the Queen's South African Medal (with four bars), the Mons Star, and the General Service and Victory Medals. 28, Salisbury Street, Rotherhithe, S.E.16.